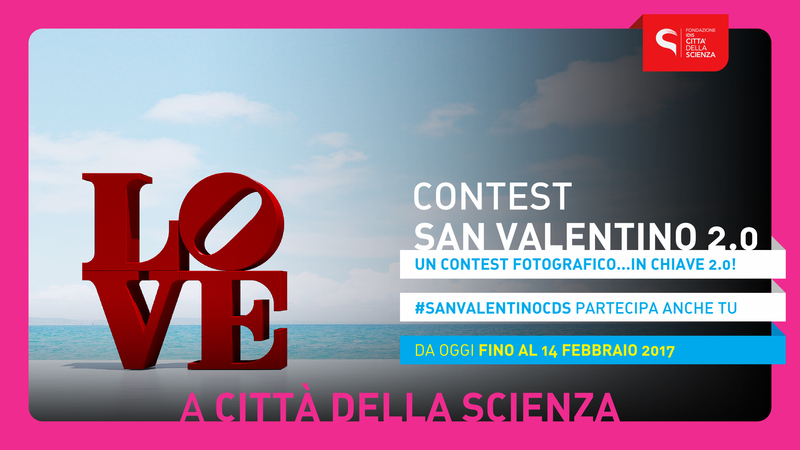 A photo contest entitled #SanValentinocds for everyone in love . Yes can love a partner, your family, an object, a pet as well as your job … generally we fall in love with what makes us feel good and gives us pleasure, and why not even science. Share with us your concept of love! From now until February 14 we want u to share with us your shots. Participating is easy, the important thing is to have a Facebook account to share your photos with the tag #Sanvalentinocds. You can send us photos of kisses – romantic or passionate – of your car, or something that is relevant to your work! * By posting a photo on your account and tagging @sanvalentinocds the user expressly you declare to have all the rights of use and exploitation of the image, and to consent to the publication on the company account and / or on the website of the Città della Scienza.